The Trikke Pon-e is a stable 3 wheeled light electric vehicle (LEV) that can lean (carve) into corners and contour to varied terrain with ease. It has an upright riding position and it is very easy to get on and go. It is also foldable and portable which makes it useful for commuting on mass transit or taking it in your car for a recreational ride in the country. In addition, it can be a good LEV for security patrols or large (business or university) campuses. 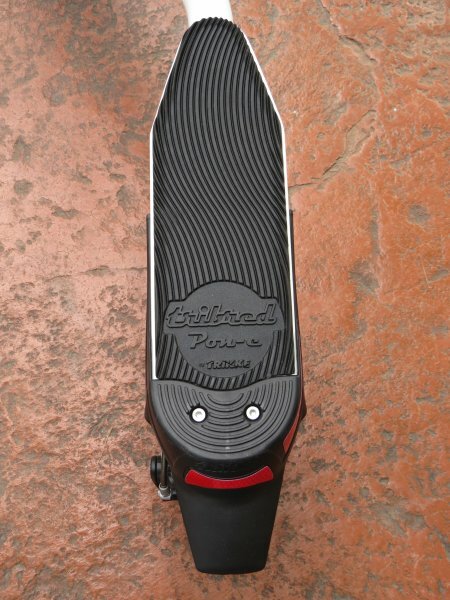 In this second part of the full review of the Trikke Pon-e 48V, you will get an idea of the ride characteristics, range test, pros, cons, and overall thoughts on this carving LEV. The Trikke Pon-e 48V has an aluminum frame that features 2 arms for the left and right rear wheels and a front tube for the front wheel and handlebar assembly. The 3CV cambering system is the joint that ties the arms and front tube together and provides for the carving capabilities along with the ability for the wheels to contour over varied terrain. 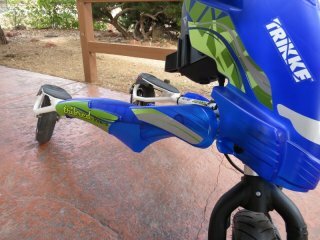 In addition, the Trikke Pon-e frame can be quickly folded (front tube folds down) by releasing the quick release levers near the front wheel. 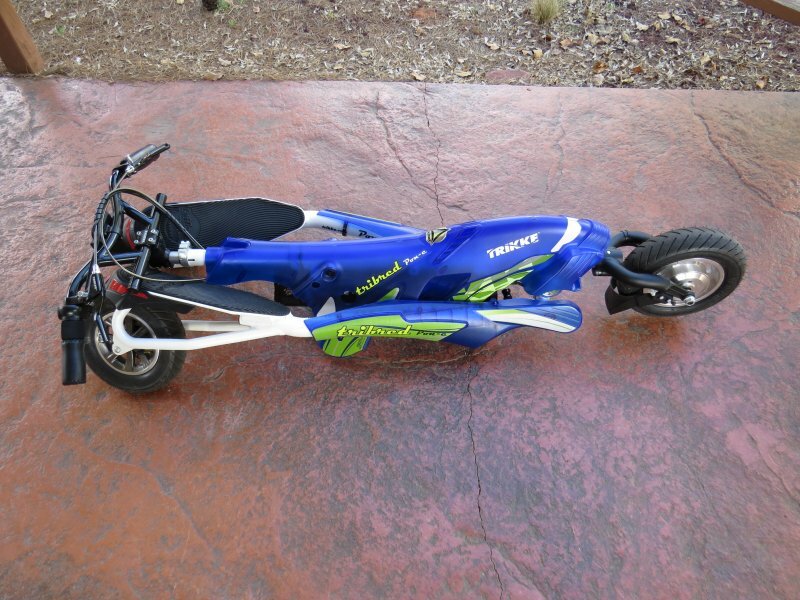 This is handy for transporting or storing the Trikke. The Trikke Pon-e can be adjusted to fit various people by adjusting the handlebar height with a quick release near the stem. A 350 watt geared front hub motor provides the assist and can power the Trikke Pon-e 48V up to 16 mph. The display in the center of the handlebars provides plenty of information like the battery level, speed, average speed, max speed, trip distance, odometer, etc. To get the Trikke rolling, simply twist the half grip throttle on the right side of the handlebars. You can vary how much assist you want with the twist grip throttle (like a volume dial on a radio). Speaking of assist, there are 2 different speed options that can be set near the battery. 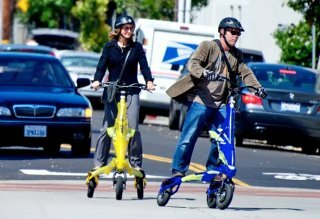 Speed option #1 (Econo) limits the speed to 12 mph and is a good option for beginner riders or while riding the Trikke in crowded areas. Speed option #2 (Express) has a speed limit of 16 mph and is best for the more experienced rider. A 48V 11.25 amp hour lithium-ion Panasonic battery provides the energy and it is attached to the front tube. It has a key that locks the battery into place and turns the Trikke on and off. 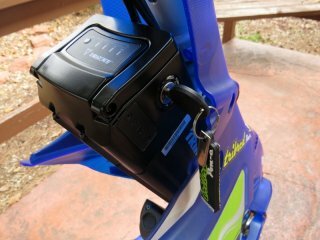 Charging the battery can be accomplished while it’s installed on the Trikke or when it has been removed from the Trikke. It takes five hours to charge the battery and there is an optional three-hour charger that can be purchased separately. 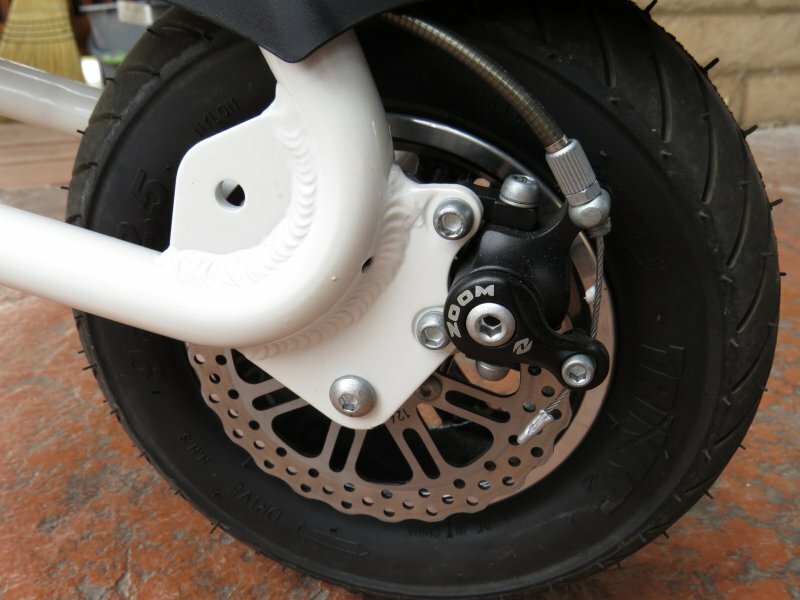 Braking is accomplished with Zoom mechanical disc brakes on each rear wheel and they are activated by their corresponding left or right brake lever on the handlebars. 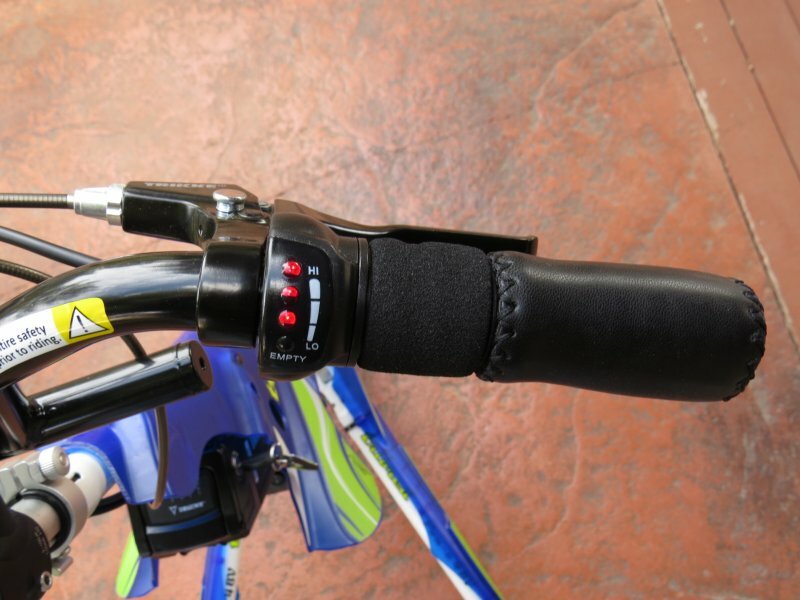 The brake levers have a locking button so that the Trikke won’t move when it is parked. If you like the feeling of carving into turns on skis or rollerblades, then you will really enjoy riding a Trikke! It really does seem like you are skiing on land because of the way it carves the corners and the way it contours over varied terrain while keeping the 3 wheels on the ground. When you combine the carving and contouring with bending your legs a little to absorb bumps and cracks in the roads, it’s pretty impressive what the Trikke can handle. It’s important to think of your body as being a part of the frame of the Trikke. 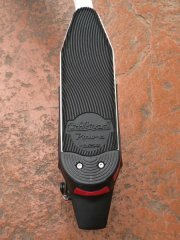 The Trikke Pon-e 48V feels very stable, even at high-speed going downhill. At 30 mph, going downhill, there were no speed wobbles at all. The stability can be attributed to the frame design and that the Pon-e 48V also has 2.5″ wide tires. The Pon-e 48V is an electric vehicle that you can add your assist to by carving. It is similar to skate skiing or rollerblading because you are pushing your legs outward to provide assist. At the same time you can move the handlebars side to side to get more leverage. It can be a whole body exercise if you want. The 350 W geared front hub motor definitely has some get up and go and it comfortably cruises along at 16 mph on relatively flat roads. It also helps climbing on the hills. On the really steep hills it slows down a bit but you can always add your own carving assistance. The motor does make some noise, like almost all geared hub motors do. The front wheel does have a tendency to peel out if you don’t have enough weight over the front wheel. You can notice that on climbs, especially if you are adding your own power (upper body movement) to provide some assist going up the hills. When you’re adding your own power there’s a tendency to rock the handlebars back-and-forth so you can put your leg power into the assist. When you’re rocking the handlebars back-and-forth, you just need to remember to put your weight over the front of the Trikke so the front wheel doesn’t slip. If you’re adding your own power you can definitely get a workout. Even if you use the Trikke just as a commuter vehicle and don’t add much of your own power, you still get some leg workout just from carving turns. If you run out of battery, it is fairly hard to move the Trikke Pon-e 48V without the electric assist. On flat roads you can carve it and get it going, but climbing hills without the electric assist is very difficult. The rear disc brakes work very well. The best way to brake is to put equal weight over each wheel and lean back a little bit while braking. Sometimes it is not always possible to distribute your weight equally, so it takes some practice to get used to applying the proportionate amount of braking power to the wheel that has the most weight over it. Here is the real world information on how the Trikke Pon-e 48V performed on a riding circuit that includes hills, flats, traffic, wind (when available) etc. While testing these bikes/trikes I like to put them through the toughest conditions (highest electrical assist with minimal input from me) to see where their bottom line is in regards to range and speed. Range: As you can see from the GPS info that I recorded, the Trikke Pon-e 48V traveled 15.3 miles and did a total elevation gain/loss of around 1,250 ft. Considering that I weigh 190 lbs and I added light assist, this is decent range for a 48 Volt 11.25 ah battery pack (540 Watt Hours) with a 350 watt motor. Please keep in mind that if you add more of your own assist, weigh less than me, ride slower and/or you use the Trikke in terrain that is not as hilly, you will get more range. These results are from tough testing. 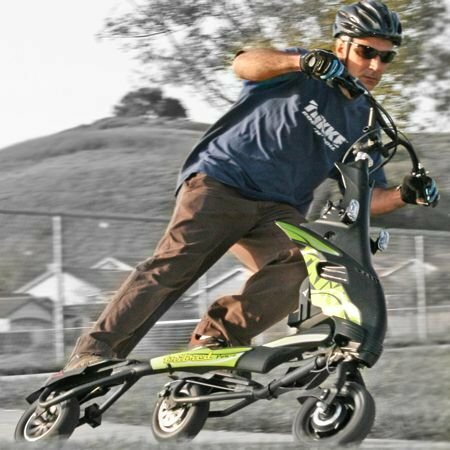 Speed: The Trikke Pon-e 48V can get up to around 16 mph on flat ground. It is slower than that on the climbs. Weight: This trike tips the scales at 48 lbs. The weight distribution of the Trikke Pon-e 48V is pretty front heavy because of the front hub motor and the battery pack being located at the front of the trike. For this type of vehicle that is good weight distribution. Fun! It is fun to have the sensation of skiing on your local roads. Carving into corners is a blast and it has a surprisingly stable feel with all 3 wheels contouring over variations in the road. 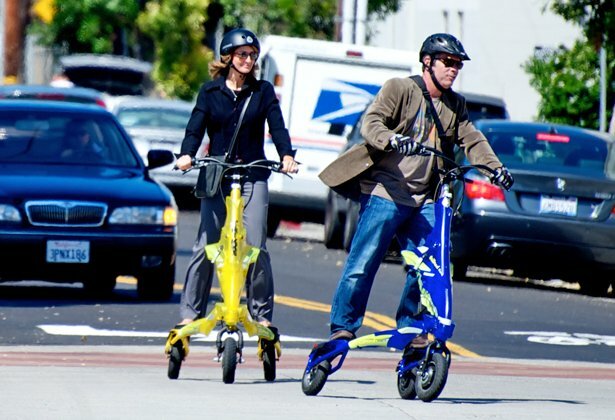 Agile: The Trikke has an incredible turning radius and you can maneuver it in very crowded spaces with ease. Portable: The ability to fold the Trikke down makes it handy for taking on mass transit or taking in your car. It also makes it easy to store in your house, apartment, or workplace. Hard to ride without assist: The Trikke Pon-e 48V is hard to move without the electric assist. On flat ground it is difficult and trying to climb any hills is very difficult without assist. 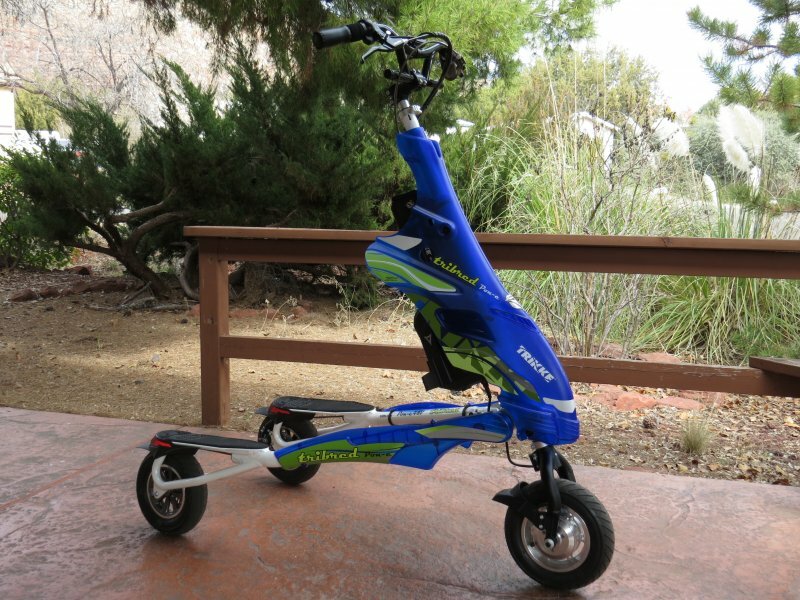 The Trikke Pon-e Lite is probably better for powering on your own without electric assist because it is lighter and has high performance tires. Heavy: The Pon-e 48V weighs 48 pounds and that makes it difficult for some people to transport very far when it is folded down. The Pon-e 36V weighs 42 pounds and the Pon-e Lite 36V weigh 38 pounds and those could be a better fit if you plan on transporting the Trikke much. Motor Noise: Almost all geared hub motors create some noise and this is true with the Trikke motor. Some people are not bothered by the noise and others want a totally silent ride experience. Overall the Trikke Pon-e is a lot of fun to ride. If you are interested in trying an electric vehicle that can provide a skiing experience on your local roads, then you should really consider the Pon-e. The Trikke electric carving vehicles can be a good fit for commuting, recreational riding, a security patrol vehicle, an EV for business or university campuses, etc. 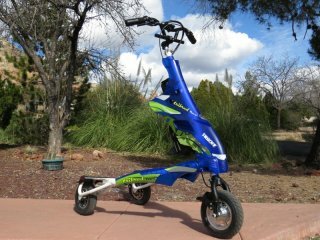 There is a lot of development in the light electric vehicle world going on right now and the Trikke Pon-e vehicles are a good example of that innovation. Please keep in mind that this is a relatively short term test. This testing can’t really give you the long term review of durability and reliability. My thoughts on the quality of this bike are from previous experiences with similar bikes. If you own this trike and have some input on the long term durability, please share your comments with the Electric Bike Report community below. Where to buy a Trikke Pon-e 48V? Check with Trikke for a dealer near you. Do you have any questions about the Trikke Pon-e 48V? Do you own the Trikke Pon-e 48V? Please share your thoughts in the comment section below.